The Italian navy says it has saved 135 migrants from a sinking boat and recovered 45 bodies in the Mediterranean. The navy said it was aiding the partially sunk boat in the sea between Libya and Italy, a route smugglers' boats use in a lucrative business to transport those fleeing wars and poverty onto European shores. In other rescues, the navy saved hundreds of migrants, part of a one-day total of some 2,000 migrants rescued in operations coordinated by the Italian coast guard. A cargo ship, tug boats as well as vessels run by volunteer groups helped in the multiple rescue operations. 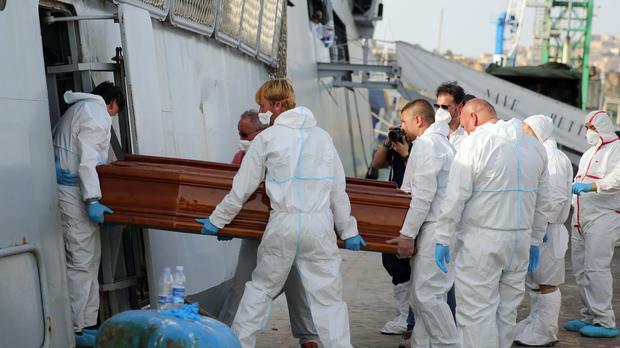 Smugglers, taking advantage of calm seas, have sent dozens of boats towards Italy this week, including one capsizing on Wednesday, killing at least five. By Frances D'Emilio, Associated Press Pope Francis has used a Good Friday ceremony to decry “all the crosses” of suffering in the world.